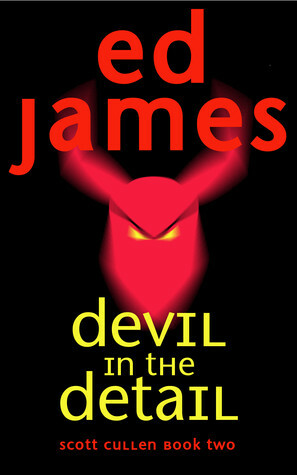 Ed James writes crime fiction, predominantly the Scott Cullen series of police procedurals set in Edinburgh and the surrounding Lothians. Ed also writes science fiction and mainstream fiction, but with a crime bent. Firstly, thanks to Ed for his generosity in giving a review copy of the book. This is the second book in the Scott Cullen series. You can click on the author's name in the labels to read my review of the previous one. When I picked up the first book on Kindle, it was because of the name, which caught my interest. This one doesn't as easily, and I feel it could have been something else. He's kept the design of his cover simple again as well. Whereas in his first book, we're taken right to the heart of the crime, in this one we are first taken through a part of Cullen's counselling after the ending of Ghost in the Machine, where he meets with his former partner's family. I find this to be a good touch because it addresses the grief in the aftermath of that book, but I felt at times that it spills over a lot into this book at the beginning, making it seem more like investigating Cullen's mindset rather than a new crime. Coming to this book, the investigation is of the death of Mandy Gibson, who is first shown missing and then found by a dogwalker. Though far from their area, Cullen and Bain are called in to investigate and they form their teams. The investigation goes to the parents, and the close friends of the family as well as the victim. The prime suspect is caught upon and the local bad-boy of the area, Jamie Cook is brought into the scenario. Then after some more work from Cullen's part and some interest on Bain's, we arrive at a second suspect in Seamus Mulgrew, the head of a somewhat interesting "church". The book and the investigation seem a little slow paced till the second murder catches us unawares. In the first book, the pace is quick and keeps the interest right from the get go. This book is a little more even paced... starts off slow and then picks up toward the middle and ending. Unless you have a fair knowledge of football teams and grounds in Scotland, some parts of the novel might be lost on you. And speaking of lost, I wish the character of Eva Law had got a better ending rather than a lost one. Profanity from Bain in frustration or sarcasm felt a little more than necessary as well. The good parts of this book are the pace and the characters. In my opinion, It holds the reader as a mystery.